distribution This is a very poorly known species that is globally limited to the southern Appalachians and adjacent Piedmont. In NC, there are records for 10 counties in the mountains and Piedmont. The easternmost record is from Franklin County. Much more data are needed to determine the range in NC and in the US, though it seems to be absent from mid- and high elevations in the mountains. abundance Rare or at least very difficult to identify, in the lower mountains and Piedmont foothills. Presumed very rare eastward over the rest of the Piedmont, and seemingly absent from the southeastern portion of the Piedmont. flight "Early June to late Aug." in the overall range (Dunkle 2000). The 17 records (two are for 20 and 21 July 2008, but with no county given) in the state with dates available fall between mid-May and mid-August. However, of the 12 records with dates for the Piedmont, nary a one is from July, making the species look like it has two flight periods! The few mountain records fall between mid-July and early August, but the flight there is bound to be longer than just a few weeks. habitat Creeks and rivers that are clean and fast-flowing. behavior Very little reported. Males patrol lengthwise along creeks and rivers. How often it flies and perches away from the breeding sites has not been reported. comments This might be the most difficult dragonfly to identify in the state, even more so than some clubtails and baskettails. It very closely resembles both Allegheny and Swift river cruisers; thus, a specimen (or possibly a photograph or two) would be needed to confirm the species. There is a report of one found dead at Hanging Rock State Park in Stokes County; however, the animal was not photographed nor saved, and thus we have removed this "record" from the database. Fortunately, in neighboring Rockingham County, one was netted and photographed in 2013 to confirm its occurrence in the north-central part of the Piedmont and to "close-up" a gap in the state range map. 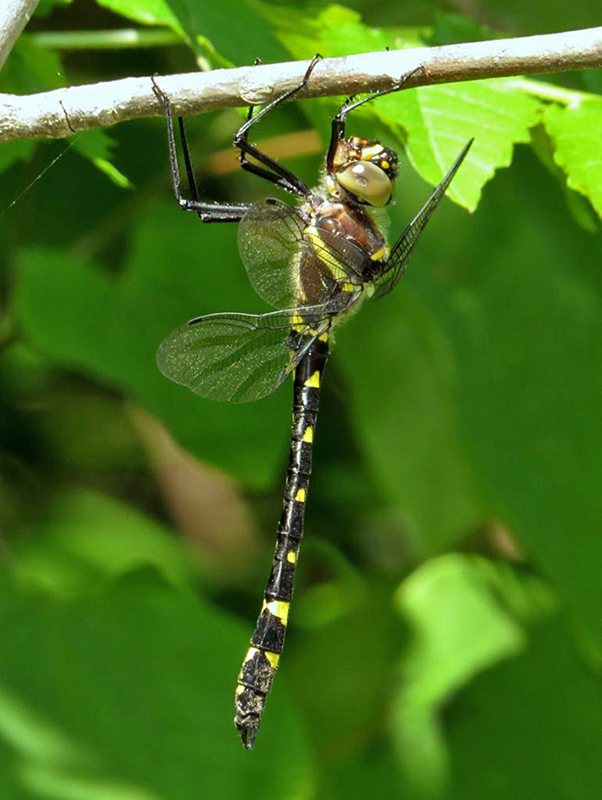 Its global rank (by NatureServe) is just G3, implying that it is one of the less numerous dragonflies in the eastern US. Considering that little collecting of odonates takes place in the 21st Century, the range and abundance of this species will likely be unclear for years to come. Comment: Rockingham, 2013-05-29, MARI - Found perched along trail at Deshazo Road, netted and identified.